The creature on the race track dipped its head, going only slightly faster, but it was no use. Soon after, the crowd erupts into cheers, and a Xepru is picked up by a set of blue Zafara hands and lifted into the air. As the other Neopians gather around to congratulate the Xepru and its owner, Zarah stayed behind at the race track to pick up her Slorg. She lifted the little, green Petpet into her paws and lifted Speedy to eye-view. "You did good today!" the striped Usul reassured, "you set a new personal record - 260.8 seconds!" "And at 19.6 seconds! Wow!" an announcer could be heard in the background. Loud applause rang throughout the room. Speedy looked at Zarah with sorrowful eyes. Zarah understood that look well - she had seen it many times before. 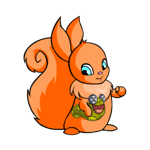 Speedy has been her Petpet ever since she was a baby Usul. Throughout her saddest moments in life, when she thought nobody cared, when she was locked up in her Neohome all day, Speedy was always there for her. The Petpet has never uttered a word, but somehow, after all this time, it was as if words were not needed. Speedy was very fond of racing. She could always see that. As a kid, when she'd bring the Slorg with her to watch races, he would smile bigger than he ever has before. It made her happy; as long as Speedy was happy. The problem was how fast Speedy is - not very fast. As a Slorg, the Petpet would move slowly, continuously falling behind the others. It broke her heart. "Let's go home." she muttered, and picked up her bag from under the race track and slung it over her shoulder. Zarah trudged home from school, making a disgusted face at the mud splattering on her lavender rain boots. She held her umbrella tightly over her, though it barely did any good. The wind was so hard that the rain just went under her umbrella and straight at her face. Abruptly, the wind picked up - was that even possible? - and blew her umbrella straight out of her paws. Instantly, she was bombarded with even more raindrops than before. Though struggling to see anything in the storm, she could barely make out the outline of a building nearby. Running to it, she felt the door handle and pushed it open, stepping inside the cool, dry shop. Immediately, she heard the clop-clop of somebody galloping towards her. "Oh no!" she heard, "let me go get you some towels!" The noise of hooves began moving away from her, into a room in the back. As Zarah's eyes adjusted to the bright lights of the shop, she could see a blue Uni coming back towards her to put a large towel, a bit too big for her small stature, over her shoulders. "What are you doing out in the rain?" the Uni concernedly questioned her. "I was coming home from school," she answered softly, shivering and holding onto the towel. "You are welcome to stay in my shop until the weather clears up more, child," the other gently told her, "my name is Lynda, what about you?" "Zarah." The Usul began noticing the contents of the shop. It was the a potion shop. She hasn't ever been inside before; she has only seen the items through the windows. Zarah was always sort of frightened to go inside; the colorful array of potions lining the shelves looked fragile, and she was sure she'd accidentally shatter one and end up with the Measles or something. Lynda noticed her examining them. "Ah, I see you've noticed my potion collection!" she spoke, smiling. "What do they do?" Zarah asked the Uni curiously. Maybe there was some sort of intelligence potion she could use to ace her test in school tomorrow! "I have a potion for everything your little heart desires - strength, healing, speed-"
"Absolutely!" Lynda pulled a white and pastel blue potion off a shelf and held it in front of Zarah, "this will enhance your speed - win races, beat your friends at tag, yes!" Zarah considered this for a while. Would it be of any use to her beloved Speedy? Can he win a race under the effects of this potion? Would he even agree to using it, or would he think it as cheating? She bombarded Lynda with questions about the potion. Yes, it may work on Petpets, but she hasn't tried it on one yet - so no promises. The effects lasted for an hour. It tasted like plums. "I'll take it!" Zarah finally said, pulling some Neopoints out of her backpack and handing them to the shop owner. Taking the towel off her shoulder and placing it back on the table, she put her new potion into her bag and opened the shop door. The rain had slightly cleared up by then - she could probably run home and avoid illness. The Usul walked into the dining room and placed a small plate next to Speedy. "Tonight, I made you a special meal!" she told him excitedly, "it has plums in it. You'll love it!" Apparently, Speedy really likes the taste of plums, because he ate it up in no time. Zarah wasn't sure if she should tell him about the potion that had been poured over his breakfast; it somehow seemed a bit morally wrong to her. Nah! she thought to herself, It'll be a happy surprise! They immediately left the Neohome for Speedy's next race. They arrived as soon as possible. Zarah checked the time; Speedy has 8 minutes to win this race before the effects wear off and he's back to normal. Come on, come on, she thought, as time ticked by and people were still setting up. 4 minutes. "Alright," the announcer, an eccentric Pteri, finally spoke, "places!" All the Petpets were put into their respective places at the starting line. Zarah gently placed Speedy down next to a Meowclops, nervously looking at his competition. They were all so fast! Feather, the Xepru from before, was even here! Zarah mentally scolded herself. With that potion, Speedy would do fine, no doubt! Then she remembered something the Uni told her. I haven't tried it on a Petpet yet, there's no guarantee that it would work on one, but I guess you'll see! Panickedly, the Usul leaned over the racing track and whispered to Speedy. "On your marks!" the Pteri loudly started the countdown. Zarah shivered, realizing Speedy has 1 minute left. The audience erupted into cheers, hoots, and squawks. The Petpets all sped towards the finishing line at a blinding speed. Speedy struggled at the starting line, a slime trail slowly being left behind him. Zarah's face contorted in horror. Oh no! It didn't work! The Slorg went slow - as slow as ever. The other Petpets were already halfway to the finishing line. It didn't work. The potion doesn't work on Petpets. Zarah buried her face in her paws to keep from tearing up at her hope getting torn away. She quietly sighed. Well, at least it didn't do any damage- her thoughts paused at a sudden loud noise. The crowd began gasping. Zarah lifted her face from her paws and looked up to see Speedy being, well, speedy. He zoomed through the track at a speed she's never seen in her entire life. It was almost as if a rocket was strapped to his back and carrying him straight to the finishing line. Zarah's eyes lit up. He was gonna win the race, for once! 15 feet..10 feet..5 feet..2 feet.. he's almost there! The audience stared in astonishment at the Slorg who they have never seen even come close to finishing a race was about to beat some of the fastest Petpets to have raced in Neopia Central. Then, abruptly, the Slorg stopped. 10 cm. from the finishing line. The crowd silenced in anticipation. What? Zarah remembered. The time limit. She put her paws over her mouth to keep from sobbing. Speedy was back to normal - slow. The other Petpets were quickly gaining on him. The Meowclops would cross the line any second now. She had to do something. "You can do it, Speedy!" she yelped, cheering on her Slorg. The silence ended as the audience began cheering on Speedy, as well. "We have," the announcer yelled, "a winner!" Zarah placed her backpack on a table once she reached her Neohome. Setting Speedy down on her table, she sat on her bed. "Are you alright?" she gently asked the Slorg. Speedy's smile grew even bigger. He was happy. "Good." Speedy didn't win the race. The Meowclops did. Speedy was close, getting 2nd place. The Slorg didn't care, though. After the race, everyone surrounded him, gushing over how fast he was going back there. It made him happy. And that made Zarah happy. However, there was one issue that needed to be dealt with. "Speedy?" the Usul cautiously spoke, "I need to tell you how you went so fast back there." She explained the rainy weather, the Uni, the potion, putting the 'plum' in his breakfast. The Slorg's eyes widened in shock. Speedy shook the upper half of his body in a 'no' motion. "You're not? Do you want me to get more of those potions?" Speedy, again, signaled 'no'. Zarah instantly understood. "So you're happy the way you are, as long as you're doing what you love?" The Slorg grinned at her, and shook the upper half of his body up and down, signaling 'yes'.